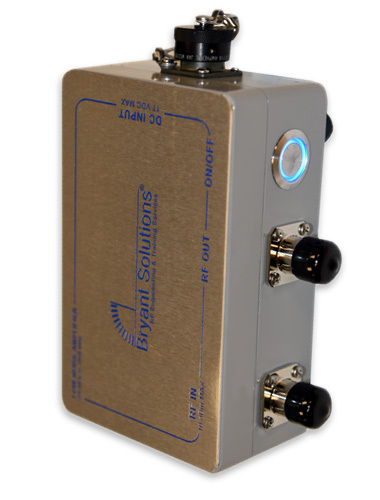 Bryant Solutions’ LNA is a great tool for quickly acquiring and tracking down external interference that would otherwise be very difficult to capture with just a yagi antenna and filter. This is especially true when attempting to determine whether broadband interference detected via a system receive port is internally generated or external interference. It is common to identify interference via a system receive port at a cell site, to then fail to capture it externally when setting out to track it down. This is usually because the net gain of your equipment (for tracking down the interference) is much less than that of the system. Bryant Solutions developed their own battery operated low noise amplifier (LNA) to overcome this obstacle. Note: Permanent damage may occur if these limits are exceeded.